포천 한탄강 현무암 협곡과 비둘기낭 폭포는 한탄강 용암대지가 개석되면서 형성된 현무암 협곡과 폭포로 그 주변에는 크고 작은 하식동과 주상절리, 판상절리, 협곡, 용암대지 등 포천-철원-연천지역의 지형형성과정을 이해하는데 중요한 단초를 제공하고 있다. 특히, 용암분출에 따른 침식기준면의 변동과 수계발달 간의 상호작용과 용암대지 내의 폭포 발달과정을 알 수 있는 독특한 폭포지형으로 지형ㆍ지질학적 가치가 매우 크다. 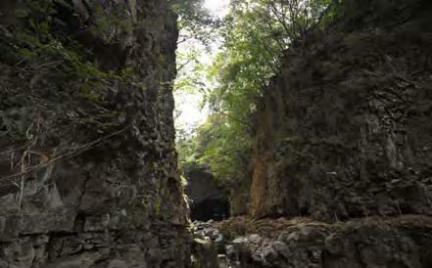 This basalt gorge and waterfall were formed when a lava plateau was eroded by the flow of the Hantangang River. 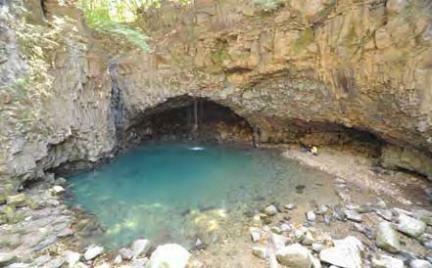 Various geological features, such as caves, columnar joints, sheeting joints, gorges, and a lava plateau, are located in the nearby area, providing important information for understanding the topography formation process in the Pocheon, Cheorwon, and Yeoncheon areas. 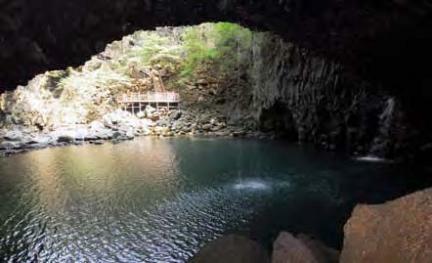 Notably, this unique waterfall is of great importance for geological and topographical researches, as it offers explanations about the development of a waterfall in a lava plateau and the interaction between changes in the base level of erosion after a lava eruption.